What has happened to all the rain and cool weather? And why on earth is it so gosh darn warm today?? The BBC weather channel informs me that a storm cell is brewing somewhere in the Caribbean and it is sucking all the clouds out across the Atlantic. Reason would dictate that I should at least be happy with this dry spell … but I am not. Over the weekend I had thought long and hard about what to feature on the blog and I had settled on some serious comfort food ~ Osso Buco on Roasted Garlic White Bean Puree. Now doesn’t that sound divine? Feels like being wrapped with a warm fleece blanket from the inside out. I even went to the butchers early today to get first pick of the wonderful cuts of beef shanks. On the way I glanced up at the sky and it certainly looked like it would rain at any moment. Alas! By the time I got home the sky was clear and there has been no sign of rain since. In fact, it was hot and sunny … not the kind of weather to be slow-cooking beef shanks. So I opted for this Malay dish instead (yeah, back to Asian food again). 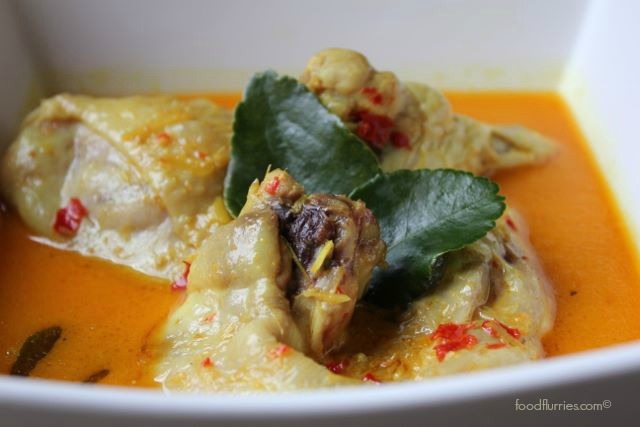 Ayam masak lemak cili api translates to creamy coconut chicken with bird’s eye chilli, and is a popular dish among the Malay community in Malaysia. Very few ingredients are needed to make this dish but beware … it has the potential to knock your socks off. Bird’s eye chillies are not to be messed with; they are HOT! Even for me I tend to find this dish far too spicy for my liking, so instead of using 100% bird’s eye chillies, I only use three in this recipe. The rest, I top up using large red chillies which have been deseeded. If you own a mortar and pestle, then good for you. The chillies, fresh tumeric root and garlic are to be pounded to a pulp along with some coarse salt. The lemongrass stalks are to be bruised. 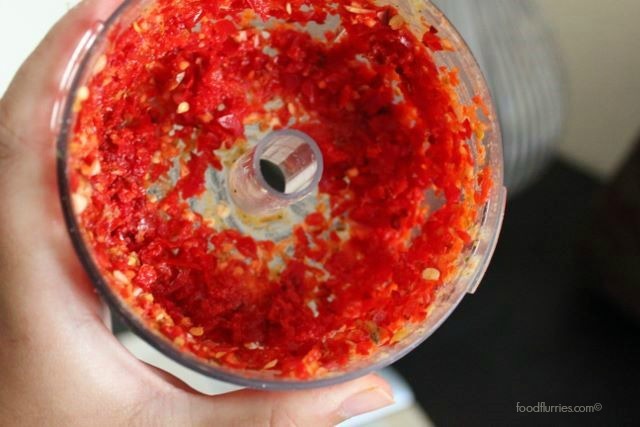 I don’t have a mortar and pestle, so I simply chuck everything into a blender: Chillies, garlic and lemongrass. I also cannot find fresh tumeric root here in my local shops, so I use ground tumeric powder instead. 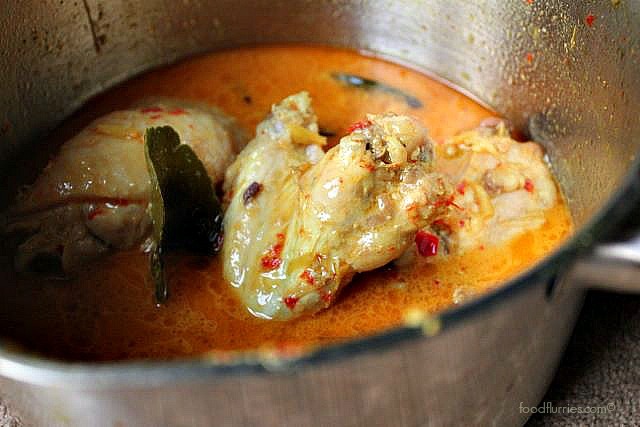 Pour coconut milk and chicken stock into a pot along with the spice paste and tumeric. Place on medium heat and add the chicken. Give everything a good stir and bring up to the boil. Cover and reduce heat to a low simmer for 40 minutes. When I make curries I always prefer to use dark meat parts like wings, thighs and drumsticks, and always on the bone. R. used to only like chicken breast fillets in curries coz that’s how curries are usually served up in fancy food shops in Australia. I call those “fake” curries. Chicken breasts are great for stir-fries, pan fries, gentle poaching and grilling but never for dishes that require long cooking times. Breast meat dries out and toughens if you cook it for extended periods of time, to the point of it becoming inedibly chewy. When you cook dark meat on the bone, the meat becomes tender and incredibly juicy. The bones release flavour into the broth along with a whole heap of collagen, which helps to thicken the gravy. The last ten minutes of cooking, throw in the kaffir lime leaves and allow the flavours to permeate thru the curry. You can shred them or leave them whole, it makes no difference. Taste for adequate seasonings and adjust accordingly. If there is a lot of fat on the surface and that bothers you, you can always skim off the excess … but traditionally this is what the dish is all about. Most of that fat layer will come from the coconut milk and chicken fat. When you cook coconut milk over and extended period of time it splits and this is what Malays refer to as ‘naik lemak‘ … the fat rises. If you are making this dish a day ahead, then simply shove the curry into the fridge and the fat will solidify on the surface. Scrape off this fat cap the next day before reheating. Curries are always served with rice (duuhh…) be it in the traditional form or pressed into rice cakes called ketupat. 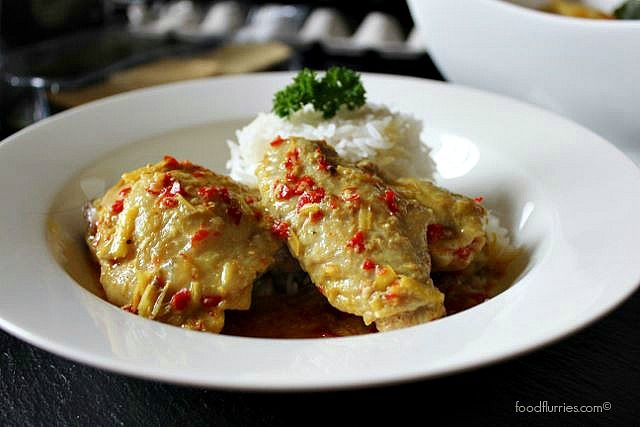 Ayam masak lemak can be enjoyed at any time and it’s a pretty casual dish. Most people in Malaysia consider this an everyday home-style meal and pretty much every food court in Kuala Lumpur will sell a variation of this dish one way or the other. Not the healthiest, but it sure is tasty! So make some for yourself at home and see how you get on.